From the woman who put child sexual assault on the national agenda with her repeated calls for the resignation of then Governor General Peter Hollingworth. 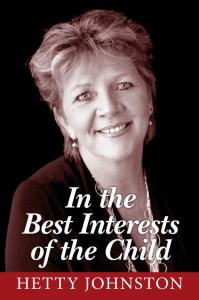 In the Best Interests of the Child is Hetty Johnston's brave account of how she came to be one of Australia's most prominent child protection campaigners. Combining the expertise of both researchers and practitioners specialising in the area of child sexual assault, this book provides an innovative, evidence-based approach to working with children and young people affected by sexual assault. It is an essential guide for general counsellors, school counsellors, psychologists, youth workers, chaplains, mental health practitioners and other allied health professionals, to provide them with the necessary information and skills to support children and young people affected by sexual assault. Its purpose is to build the confidence of these frontline workers and to reassure them that they do in fact possess the necessary skills to continue to work with their client once the issue of sexual assault has been raised. A personal safety storybook that can be used to begin to explain the meaning of privacy, private parts and keeping safe for young children. Purchase both picture books and receive a $5 discount!